Japan Airlines (JAL) and award-winning master chocolatier Mr. Jean-Paul Hévin have decided to collaborate once again (for the 3rd time) to create some special treats for passengers flying on JAL international premium classes. During December and January, JAL will be serving macarons from Jean-Paul Hévin in First Class and Business Class on select flights departing from Japan. 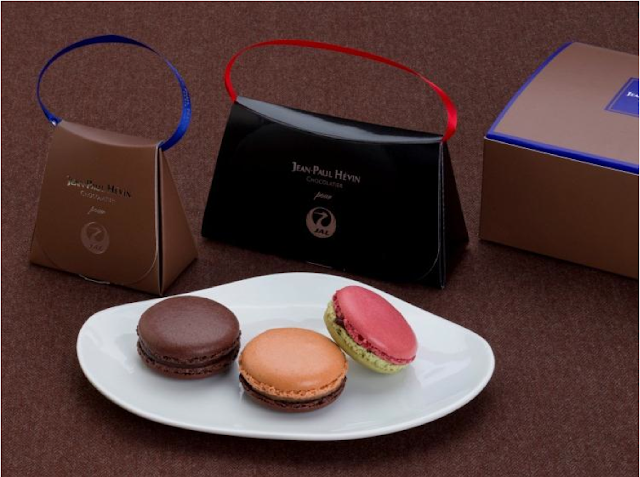 JAL has specially designed a JAL Original package for the macarons served in First Class with JAL and Jean-Paul Hévin label engraved on it. The red ribbon is chosen because it is the corporate color of JAL. During December 2012, JAL will be serving the Feu Follet (Noel Limited Edition) and the award-winning Amer-Bitter Dark Chocolate macarons in First Class. The Feu Follet macaron is specially designed for Christmas. It is filled with pistachios-flavored ganache which gives a rich and refreshing sour taste. Amer-Bitter Dark Chocolate on the other hand is a timeless macaron made with dark chocolate biscuits and ganache. It was also awarded the best macaron of Paris in 2012. During January 2013, JAL Original Orang’in macaron will be served with the Amer-Bitter Dark Chocolate macaron in First Class. Orang’in will have similar flavor of the JAL Original ice-cream L’Orangerie which is also created by Jean-Paul Hévin. The same ingredients of caramel, orange and ginger are used to create this JAL exclusive macaron. This is available in First Class on flights departing from Tokyo Narita to Paris CDG, London Heathrow, Frankfurt, New York JFK, Chicago and Los Angeles. For business class passengers, JAL will be serving the Amer-Bitter Dark Chocolate macarons minus the fancy special package in December 2012 and January 2013. However to celebrate the launch of SKY SUITE 777 on the Tokyo Narita - London Heathrow route on January 9 2013, JAL has created a special package just for the business class passengers on this route. This time blue ribbon is used as that is the color of the Jean-Paul Hévin label. This is available in Business Class on flights departing from Japan to Paris CDG, London Heathrow, Frankfurt, New York JFK, Boston, Chicago, Los Angeles, San Francisco, San Diego, Vancouver, Honolulu, Moscow Domodedovo, Sydney, Bangkok, Singapore, Delhi, Ho Chi Minh City, Hanoi, and Kuala Lumpur. A box of macarons will be placed at the self-served counters after the first meal service. For the SS7 launch special package, JAL will start serving them on SS7 launch flight on January 9 2013 until supplies lasted. Every Business Class passengers on the flight from Tokyo Narita to London Heathrow will receive one from the cabin attendant. A bit surprised that Jakarta was left out in this promotion as it is the only regional route with First Class service. Given the resort routes like Honolulu and Sydney are also part of the promotion, I am not sure why Jakarta was left out.